This portrait is of the inspirational and legendary dancer, singer and cabaret artiste Dawn Hampton, who performed with artists such as Cab Calloway and Bette Midler, and inspired Lindy Hop dancers all over the world through her teaching of musicality. Learn more about Dawn and her incredible family of musicians in the documentary “The Unforgettable Hampton Family”. This painting depicts Dawn dressed up for one of the theme nights at the Herrang Dance Camp in Sweden in 2008. 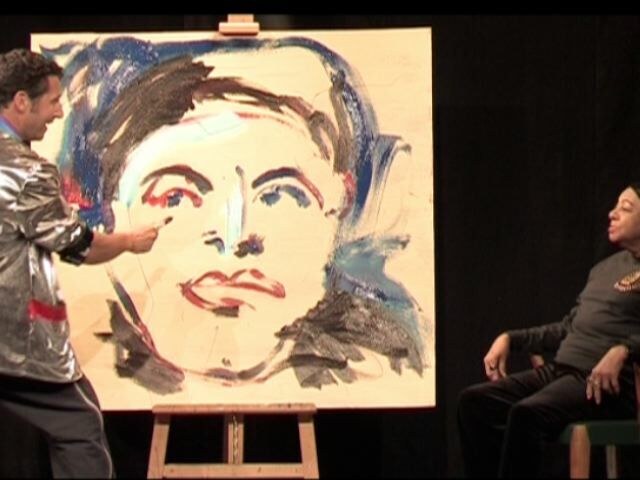 The painting was displayed as part of Dawn’s 82nd birthday celebrations in San Francisco, June, 2010. Sadly Dawn just passed September 25th, 2016. She will be greatly missed. Dawn and her portrait, the Harlem Hotshots, Chris Lee and I at the Diego Rivera Theater, City College of San Francisco. Dawn and I at the Diego Rivera Theater, City College of San Francisco.